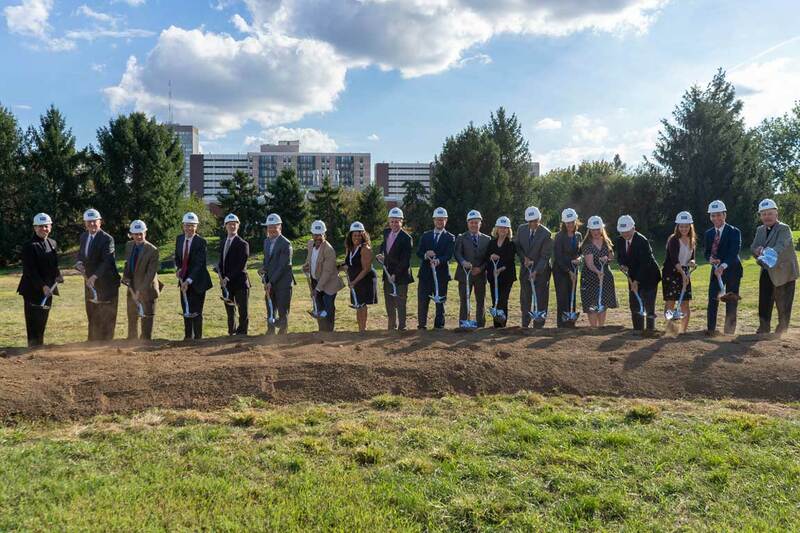 Members of the Saint Louis University community turned out Monday to watch the ceremonial turning of the first dirt for SLU's new Interdisciplinary Science and Engineering Building. Construction on the 90,000-square-foot, three-story structure will begin in November with a completion date tentatively set for summer 2020. Research computing and data visualization support center. The University will finance the project through a bond issue that will be repaid over a period of years. Michelle Sabick, Ph.D., dean of Parks College of Engineering, Aviation and Technology and a professor of biomedical engineering, said the building committee wanted the building to be a destination for faculty and students. "The building will be an inviting space where science is on display," she said. The University plans to seek LEED (Leadership in Energy and Environmental Design) Silver certification from the U.S. Green Building Council for the new building. This would be SLU’s second LEED-certified building – Doisy Research Center is also certified – and the first with silver-level status or above. Dana Baum, Ph.D., associate professor of chemistry, said she was excited that the ISE Building would assist faculty in being able to follow the Jesuit mission of educating the whole person with hands-on experiential learning in state-of-the-art labs. Hastings + Chivetta is the architect, and BSI Constructors Inc. will serve as general contractor.